The weather is heating up, and air conditioners across the country will soon be working to fight against it. Before you turn yours on after its winter break, work through this 5-step checklist for HVAC maintenance. 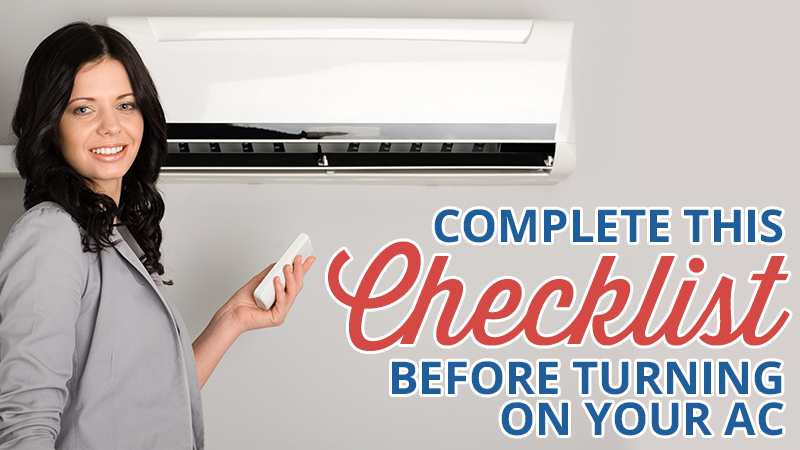 All of the air that runs through your AC system begins at the condensing fans, so you should follow suit in your checklist. For condensers on the ground, the vegetation that was cut to clear space for it may have crept back around it over the past year. If it has, make sure to give it a trim. If you feel comfortable looking deeper into the fan, you can inspect the interior for signs of fungus or mold that have a tendency to grow around the relatively damp and warm environment around the coils and wiring. Even if you switched out your air filters at the beginning of winter and haven’t turned on the AC since then, they are still working along with the other functions of the HVAC system. Replace the air filters so the captured airborne particles and bacteria don’t smash through the filter when the AC turns on. The first thing to check on the thermostat is the batteries. If you’re not certain when they were replaced last, then assume it’s time for a fresh set of batteries. A battery energy reader can take away the guesswork if you’re unsure. You can also consider swapping to rechargeable batteries. That way a few hours in the charger each year will ensure your thermostat is ready to perform. The world of home heating and cooling is still advancing along with the technology of today. Advanced thermostats can analyze patterns in energy consumption, temperature selection and actual temperatures throughout a home to customize the way your HVAC system works. This makes your home more comfortable and saves energy. Newer condensing fans can run with less energy consumption and less noise, causing less aggravation to the environment in multiple ways. If your equipment is old enough, an upgrade may pay for itself over a year or two from the reductions in your electrical bill. An emergency AC repair or upgrade in the middle of a heat wave can leave your home unbearable for days. Have a professional HVAC contractor inspect your air conditioning system before the heat wave hits, giving you an extra set of eyes to double-check that everything is working smoothly. They can assist with more difficult procedures like repairing the electrical components that control your air conditioning, installing new components that use less energy or finding the hidden leak in your ducts that is damaging the efficiency of the system. If your home or office is in the central Ohio area, then you can call on Metro Comfort Systems for all of your HVAC maintenance, repair and retrofitting needs.